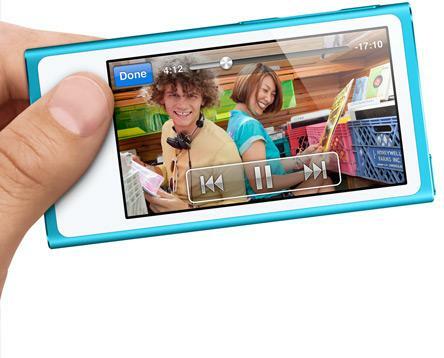 The new iPod nano is 5.4-millimeters thin, which is 38 percent thinner than its predecessor. It will be available in seven colors: aluminum, black, purple, green, blue, yellow and Product(red). iPod nano launches in October. It will cost $149 for a 16-gigabyte model. The iPod shuffle will also remain available for $49 in a 2-gigabyte model. The iPod nano still features an FM tuner with DVR-like functionality for pausing and rewinding. It also has a built-in pedometer with support for Nike+ integration. Bluetooth is also built in to the device, which means audio can be streamed wirelessly from the iPod nano without any accessories. 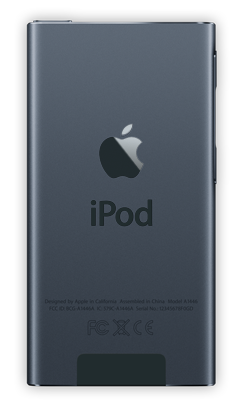 The iPod nano's Radio window located at bottom of device. It also features Apple's new Lightning connector for iOS devices, which is also found on the iPhone 5. The iPod nano will use Apple's new Lightning connector. Apple promises 30 hours of music playback with the new iPod nano, which is the longest battery life of any nano to date.